July 10, 2018 (New York, NY) – Marianne Sciolino, executive director of Sciolino Artist Management (SAM), has announced the addition of violinist Francisco Fullana to its roster of distinguished soloists. The firm has assumed general management for Mr. Fullana, who is represented in Spain and Mexico by BA Management and in Japan by The Munetsugu Office. The award-winning violinist, most recently the recipient of a 2018 Avery Fisher Career Grant, is a native of Mallorca in the Balearic Islands of Spain and is now living in New York City. Mr. Fullana enjoys a multi-faceted career as an orchestral soloist on both sides of the Atlantic, a committed educator, and a versatile chamber musician much in demand at festivals in the U.S. and Europe. In September 2018 he joins the prestigious CMS Two roster of New York’s Chamber Music Society of Lincoln Center. 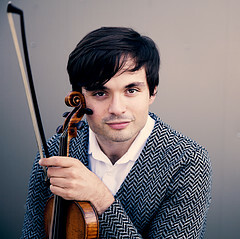 Born into a family of educators, Mr. Fullana began studies in his hometown of Palma de Mallorca, graduated from the Royal Conservatory of Madrid, received bachelor’s and master’s degrees from The Juilliard School, and earned his Artist Diploma from the USC Thornton School of Music as a student of the renowned violinist Midori. He currently performs on the 1735 “Mary Portman” ex-Kreisler Guarneri del Gesù violin, on loan from Clement and Karen Arrison through the Stradivari Society of Chicago.